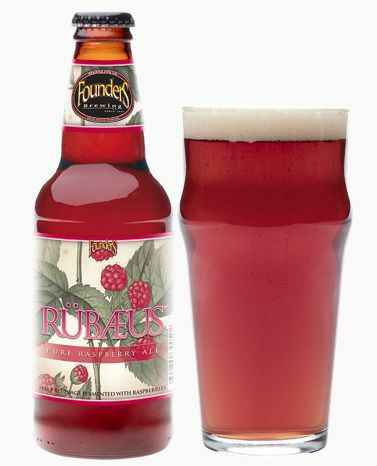 Rubaeus Raspberry Ale (by Founder's) is tart, refreshing, sweet, and natural-tasting — an American take on Framboise Lambic. When Erik Jensen took over as brewmaster at Green Flash Brewing at the beginning of this year, he knew he had some big shoes to fill. The San Diego brewery had become one of the biggest in California over the past decade, thanks to former brewmaster Chuck Silva’s way with aggressively flavored, highly hopped IPAs. This year, with Green Flash poised to open an East Coast facility and double in size, Jensen’s new offerings had to capitalize on the trends of 2016. And two of them, in particular, did: the Passion Fruit Kicker — a wheat ale with passion fruit juice — and the Tangerine Soul Style IPA. Both are pretty great, thank goodness. But many craft beer drinkers remain wary of fruit infusions. Take Ballast Point Brewing Company, Green Flash’s San Diego neighbor, which has been on a fruit rampage lately. Some options, like the Grapefruit and Pineapple Sculpin IPAs, are delicious. Others, like Ballast Point’s Watermelon Dorado, taste like someone dropped in a handful of Jolly Ranchers. I’ve been let down many times by fruit beers, which all too often taste either like candy or stale juice. But in the past year or so, my optimism has returned. Here’s the kicker (skeptics, take note): added fruit succeeds when it accents an already-great product. But no fruit, however exotic, can turn a mediocre brew into something worth sipping. Most fruity beers, I dare say, don’t work. But I’ve listed eight below that do. This list does not include anything from the local Libation series by Artisan Beverage Cooperative in Greenfield, because those ginger drinks, while wonderful, are not traditional starch-brewed beers. You’ll also see that I’ve listed no blueberry beers. That’s because I’ve never had a palatable one, and I’ve been trying for years. Sorry, blueberries, I just can’t take the heartbreak anymore. As a general trend, stronger beers are thicker and sweeter. When a fruit-flavored IPA surpasses 7% or so, I brace myself for a smack of syrup. No such bad luck here. Hop Nosh isn’t the most interesting brew, and the hops are rather muted, but it’s impressively crisp and refreshing for a strong IPA. By now, you’ll have noticed that I try to steer clear of too much “juice” flavor. But some readers, I’m sure, are seeking an option that’s heavier on fruit than beer. Founders makes a great one, called Rübaeus, which tastes like hard raspberry juice and… that’s pretty much it. It’s tart, refreshing, sweet, and natural-tasting — an American take on Framboise Lambic. Mango is a fickle ingredient. When concentrated, it’s tooth-achingly sweet. Au naturale, it can acquire a weird tang. But this Clown Shoes offering is nether syrupy nor bitter. In fact, it’s zingy and refreshing, with the fruit rounding out the clear, light-lager flavors of the German-style base. This coppery pale ale, available on seasonal rotation, is very drinkable — the colder the better. It’s slightly bitter on the hops side, which prevents the mango — more amply added here than in the Kolsch listed above — from hitting the sweet ceiling. And is that a hint of passion fruit? This one isn’t sold in bottles, but I grabbed the opportunity to try it on draft at The Quarters in Hadley a few months ago and didn’t regret it. This wheat lager is a nice twist on a citrus ale, since blood oranges are more berry-like and less bitter than regular oranges. The hibiscus provides aroma, and traces of lemongrass, coriander, and chamomile add nuance as well. Brewed with organic pomegranate juice, acai juice, and coriander, this cloudy ale is quite good, with the slightest tang of pomegranate. It’s not too sour, with just the right amount of berry. Like the Camp, Wannamango, it’s especially good when served extra cold. I am shocked that I like this one so much. It’s everything that Ballast Point’s Watermelon Dorado is not: bright, wheaty, and refreshing. It takes like a fresh squeeze of real, slightly-sweet juice, rather than watermelon candy. Available seasonally from April to September. Another seasonal ale, brewed with black and red raspberries, plus lemongrass. The flavor leans hard toward raspberry jam, but somehow avoids syrup territory. It’s pungent, fun to drink, and — like its companions on this list — a well-made beer that retains some flavorful nuance in the face of a full-on fruit attack. > Even if you spent most of your college nights with a Solo cup in your hand, chances are you didn’t major in Beer. Time to remedy that. Beerology, Northampton’s new homebrew shop and education center on Pleasant Street, is now open for business. The shop sells all the supplies needed to make beer, wine, cider and kombucha, ranging from basic brew bag kits to high-end appliances. > Tree House Brewing in Monson, one of New England’s biggest cult-favorite small breweries, is one step closer to expansion, and possibly some distribution throughout the state. On Sep. 29, the company secured a $7.7 million bond from MassDevelopment, which will help the company build its new 150,000 barrel brewing facility (Tree House, which currently sells only on-site, will produce about 13,000 barrels this year). The entire expansion will cost an estimated $18.5 million.